How do you see the SPX closing on Monday (2/11)? Congrats to @Lico Inv the Stockaholics Daily Stock Pick Winner for (2/8)! On to the next! 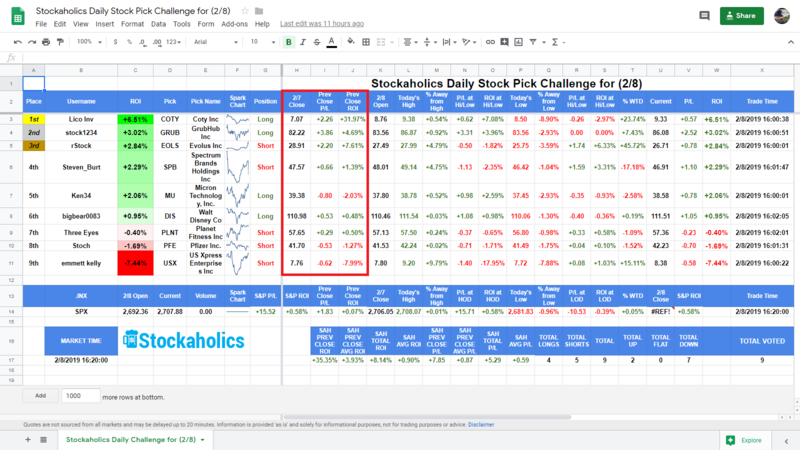 The Stockaholics Daily Stock Picking Challenge for (2/11) starts at the opening bell on Monday, February 11th, 2019. Remember...the challenge starts at the opening bell on Monday, February 11th! How does Stockaholics think the S&P500 will close 2/11? No daily poll tally for Stockaholics on Friday. Credit goes to the FLAT/UP votes! 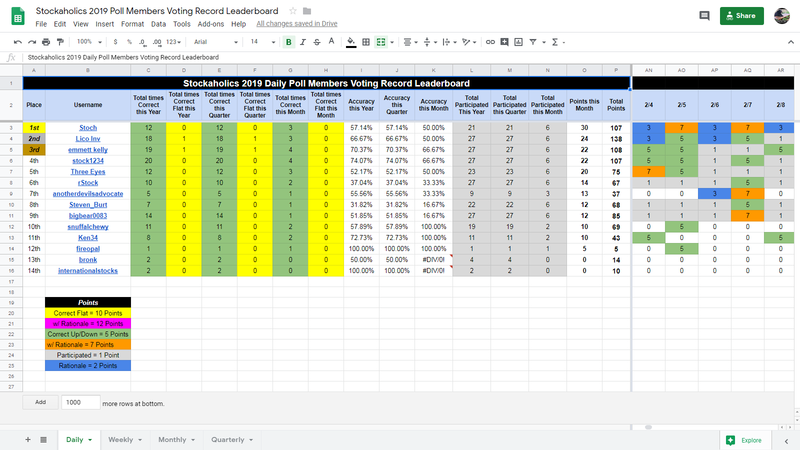 Congratulations to today's daily stock pick winner and 5th time winner of the daily stock pick challenge in 2019 (1st time winner in February!) -- @Lico Inv! Some worthy mentions also go out to our 2nd place winner -- @stock1234 and 3rd place winner -- @rStock! 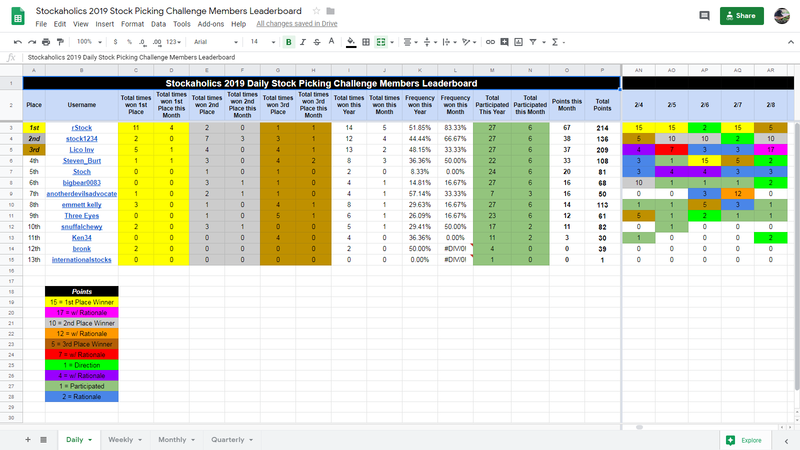 @rStock is our current leader this month with 15 points! Longest active daily poll winning streak belongs to @Ken34 with 4 straight correct daily market calls. 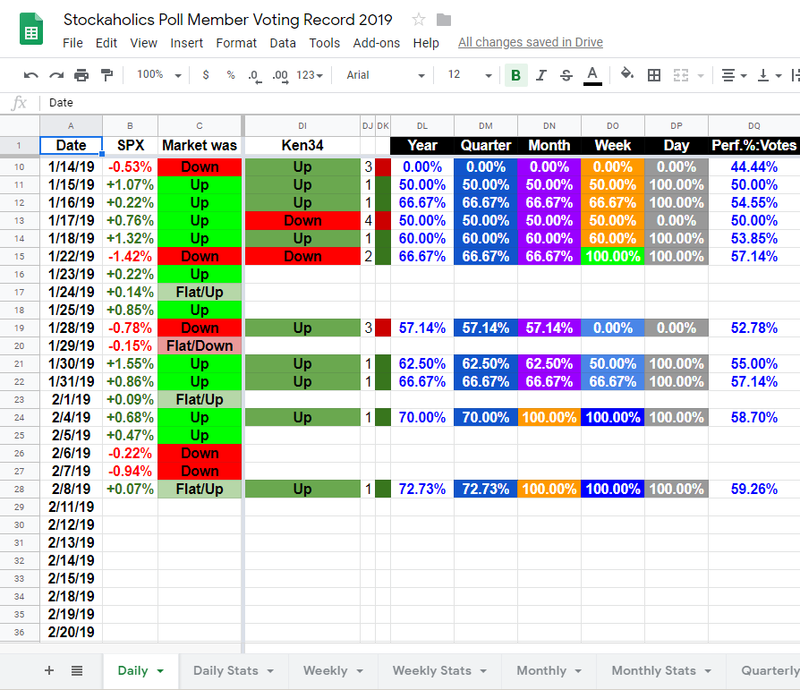 Best overall daily poll percentage leader in 2019 belongs to @stock1234 at 74.04% daily poll voting accuracy this year. 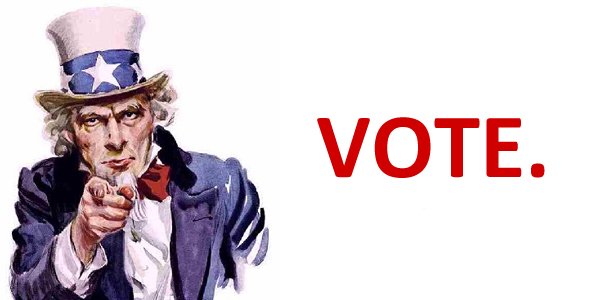 Best overall daily poll percentage leader this month belongs to @stock1234 and @emmett kelly members at 66.67% daily poll voting accuracy this month. Most consecutive correct daily market calls in 2019 belongs to @bigbear0083 with 9 correct calls. @Stoch is our current leader this month with 30 points! Notable mentions to @Ken34 with the current Stockaholics daily market direction winning streak high at 4 in a row. Good job! 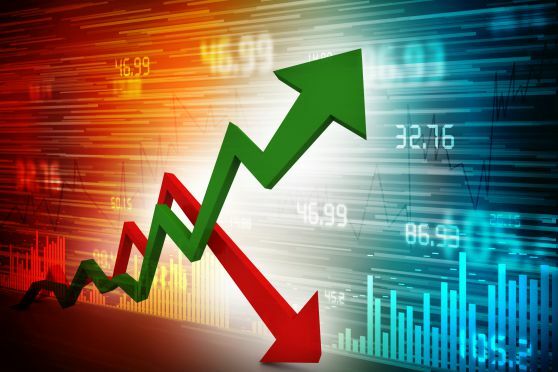 As some of you guys may know after reading these posts, Google Finance is experiencing major issues today, and is printing out incorrect data in its data feeds which is unfortunately affecting the Google Sheets. It's very possible that the final results from Friday's comp was actually not accurate. Unfortunately, I just don't have the time to sit here and check up on each ticker to make sure everything is correct. That would take me forever! Please check the data in your spare time and if you guys find any errors with the data just post it in here and I'll see if I can correct them. hoping the data feeds will be back to normal come next week! Awww. COTY was truly UP 30+%- including Pre-market. too bad pre-/after- hours don't count in these contests. I hear ya. I know last year we had someone also mention that as well. Honestly, the reason why I'm not using the prior day's closing prices as the starting point for everyone's picks, as opposed to the next day's opening prices is to eliminate the gaps (up and down). Because let's face it, someone could pick something that gaps in the extended hours for whatever reasons (earnings release, etc...) and could then quickly close out their position the next morning and very easily take the win if that makes sense? Having everyone's picks prices start at the next day's open makes more sense (or at least it does for me) not to mention makes it more competitive, challenging and fun for everyone. Maybe I'm the only one in here who feels this way about this? I actually don't know since I haven't asked the rest of our participants who regularly partake in these competitions on here. What do you all prefer as the starting points for prices on picks? The "prior day's close" or the "next day's open"? Let's hear 'em. I was kinda hoping people would have chimed in their opinions about this on this thread way before the new year got underway, so I wouldn't have to make changes during mid-year, if we did go ahead with the change. Anyway, I'm not too sure if you knew this @Lico Inv but on my spreadsheets (at least for the dailies) I do actually have a column on there that shows how everyone's picks did from the prior day's close (meaning it also includes the after-hours/pre-market that you're taking about). Obviously, I'm not sorting the sheet using those prices. I use the opening prices. Where I have it highlighted in the red box shows it from the prior day's close. @bigbear0083 , i vote for market open time for contest to begin. makes it more interesting. "Next day's open" is my vote as well. Please close ARWR $16.70 2:11 ET - Thanks!